We had Gram's first birthday party over the weekend at Supino Pizzeria in Eastern Market, and I realized I've been meaning to write about this place for months. 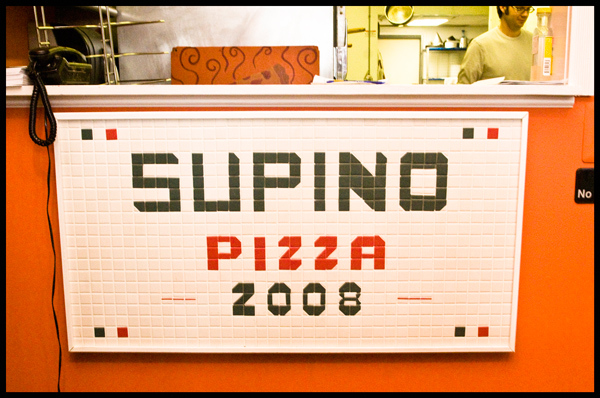 Ever since it opened six months ago, Supino's has been our family pizza destination nearly every week. When it was warmer we would walk up there on Friday nights with the kids in the wagon and tie the dog up outside, tossing him any pieces of the delicious crust we had the nerve to spare. I always loved going out for pizza with my family as a kid: all Supino's needs is a Ms. Pac Man sit-down table and this would complete the whole nostalgia thing for me. On one of our first trips Dave (the wonderful, hard-working owner and pizza chef) came out to talk to us and saw Gram gnawing on a crust. "Was that his first pizza?" he asked. It was. He considered it quite an honor to have made my son his first pizza, and we considered that incredibly adorable. The pizza is without a doubt some of the best I've ever had. It kind of reminds me of a less snooty version of the Outer Richmond's Pizetta 211 in San Francisco: delicious, thin-crust experimental pizzas (with plenty of more traditional offerings). Menu here. Although I am a huge fan of three or four of the pizzas, I can never bring myself to order anything but The Bismarck: a pizza with an egg cracked in the middle before it goes into the oven. AMAZING. Now, when my wife calls for a large pick-up Bismarck, Dave usually says, "Tell Jim I'll see him in a few minutes." We have had yuppies-with-kids-in-Detroit pizza night get togethers here before and the kids run around and create havoc and bother the other customers, so Dave agreed to open up for a few hours on Sunday when he's usually closed so we could have a private birthday party. It was a great venue and everyone loved the pizza. If you find yourself in Detroit, you're not going to find a better spot to get a slice or a whole pie.